Gion is Kyoto’s traditional entertainment district. It is the realm of geisha and hostesses. Gion is loveliest in the early evening, and a visit to Gion at this time offers the best chance of spotting a geisha on the way to or from an appointment. Our Gion evening walk starts at Yasaka-jinja Shrine, the patron shrine of the district, and plunges into the magical backstreets of the district. Along the way, we pass along what I consider to be the loveliest single street in all of Asia, before taking a pass through the Pontocho entertainment district on the far side of the Kamo-gawa River. 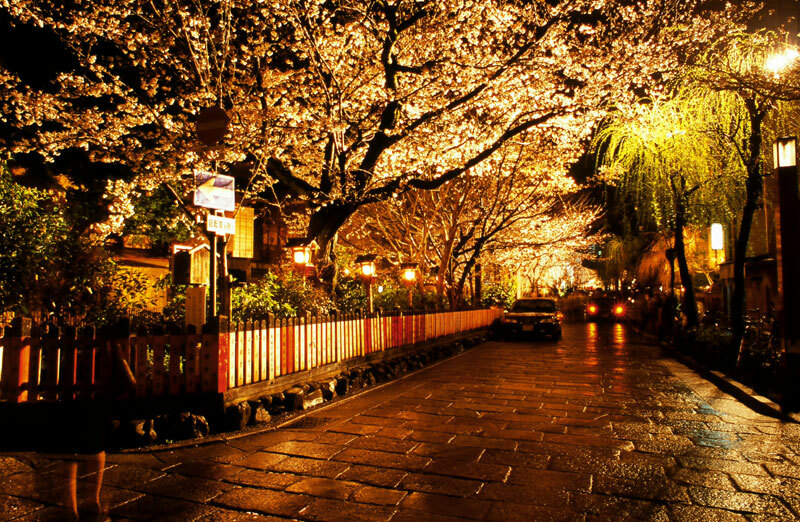 This romantic route is truly the best way to experience the magic of Gion. This walk takes two hours and can be done by anyone comfortable with a short walk. It’s mostly flat or downhill. The walk can be done Monday to Saturday (we do not offer this walk on Sundays, when there’s little chance of spotting a geisha). We don’t recommend doing the walk in the mid-August Obon holiday period or from December 29 to January 3. In order to maximize your chances of spotting geisha, we recommend starting the walk at 5pm between October and April and at 5.30pm from May to September. Note that geisha sightings are not guaranteed. The walk costs ¥25,000 per group (NOT per person) plus expenses that average about ¥1,000 per person (entry fees, snacks etc).